A healthy life in line! Fitness is not just a word it has become an emotion recently. Everyone wants to take up fitness classes irrespective of the age. Not to be surprised but so many fitness products are also on the release every day. Fitness products have become a part of our houses the very primitive to be the weighing machine. But no matter how healthy you live during your young age you tend to face some loose skin and wrinkled face in your old age. That doesn’t mean healthy lifestyle should stop at old age. It depends on the individual and the style they chose to live. If your parents or grandparents are fitness freaks but facing old age challenges and would like to move around without people support then you can afford to buy such medical aids for them depending on their needs. ‘Healthline’, this brand is amazing for these fitness aids or more likely medical aids for all ages, but they are exclusive in the elderly care unit. This brand has positioned them in the market by supplying quality products meeting the demands and needs of the buyer. The quality is ‘A’ grade and customer satisfaction they have earned is 100 percent. 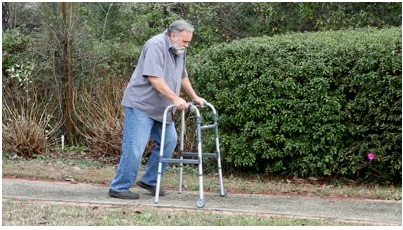 Folding walker Deluxe W/Front 5’’ wheels: Because you never want to give up that majestic walking style of yours. With these foldable walkers, you will have a support system all the time. Knee walker scooter steerable W/handle brake and basket: Why should young ones have all the fun? Yes. It’s a scooter for those who face knee problems and add up fun while using it. Cane with seat: What?! Yes, you heard it right, a foldable cane that opens to offer you a seat and when folded it acts as your third leg. 4 wheel Rollator heavy duty W/handle brakes: With these getting around was never easier or more convenient. Yes, this is specifically designed for bariatric patients where they can have some fun while moving around safely. Bath benches: Showering or bathing is never a problem again with these bath benches from the brand. With 4 variants in this line, bath benches are one best selling products of this range. Desk arm padded wheelchair: Old age in its ripe state can make us wheel-chair bound. But the wheelchairs here are very sophisticated and comfortable. This is durable and lightweight with flip back desk and armrests. Good news is that the rear tires offer superior performance and provide a smoother ride. There are much more products from this quality-bound brand and if you have an idea of purchasing special kits for elders then this is a must try product. On a serious note, old age cannot strip us off of our comfort with these products.